If you’re a garlic lover like me, what can be more fun than growing your own? Actually, I could say that about a lot of things that I grow because, well, I just find it fun to be able to grow things, especially if they’re a little different. For example the ginger (root) I’ve been growing in a pot in my sun room for the past few years. Why? Simply because I can! Back to garlic. Garlic is a bulb and much like flowering bulbs such as tulips, daffodils, etc., garlic needs to be planted in the fall to be harvested the following summer. Why fall? Certain bulbs need a cold treatment the best development of the roots and the bulb. Garlic is one of those bulbs. When buying bulbs, keep in mind you don’t want to plant the bulbs you buy in your local grocery store because they are typically grown in much warmer climates and won’t be hardy in our climate. 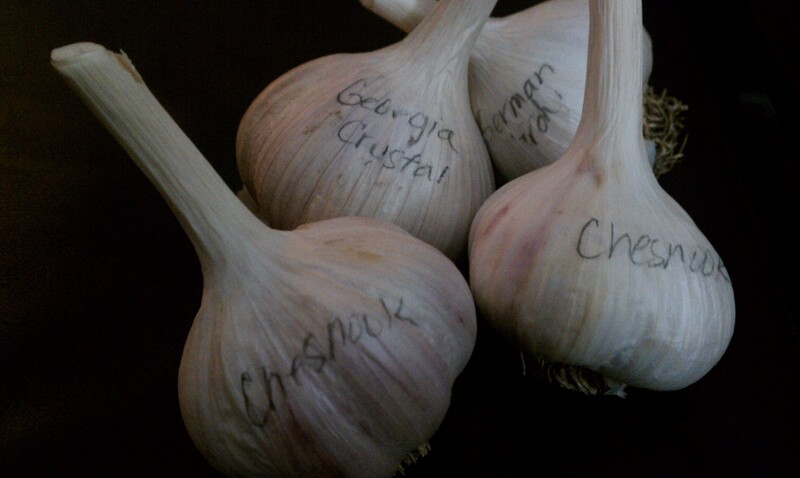 Instead, it’s best to buy local or cold hardy Garlic bulbs. I bought mine at EGG|PLANT Urban Farm Supply in St. Paul this year, but you should be able to pick them up at other garden supply stores or order them online. The Growing Garlic in Minnesota piece (below) has a nice list of Garlic sources as well. As far as what kind to buy, there are many types and varieties of Garlic, but they all fall into one of two basic varieties: hard neck and soft neck. The main difference is that hard neck produce flowers (a.k.a. scapes) and bulbils (baby bulbs) while soft neck do not produce flowers. If you like garlic scapes and plan on cooking with them or using them in arrangements, you will need to buy hard neck varieties (soft neck will not produce minimal scapes if any). Beyond that, there are more types and varieties varying in flavor, temperature (mild to hot), etc. As for me, I’ll be planting three hard neck varieties: Chesnok Red, Georgia Crystal and German Extra Hardy. If you decide to grow Garlic and want more detailed information, download the pdf of Growing Garlic in Minnesota from the University of Minnesota. This is filled with detailed info on soils, water, weather, insects, diseases, pretty much anything that might impact garlic growth. Growing Garlic? Feel free to share your story!